Draplin Design Co. "DDC-073 HEAVY DUTY Torso Cover"
“Are you a large person? Pleasantly plump? A little on the hefty side, perhaps?” All joking aside, quite a few of my friends are of the larger variety, and I know it can be tough for them to find cool threads in their size. A lot of times it’s hard for independent brands to stock the larger sizes – the blank shirts cost more, and there’s the risk that they just might not sell. Luckily you can count on Draplin Design Co. to bang out a solid design exclusively for the big men. It’s ONLY available in 2XL – 4XT! Now, my rambling can’t even hold a candle to the captivating words that flow from Aaron Draplin‘s lips (or or from his fingertips, in this instance), so make sure you read the full description over at the Draplin Design Co. Merch site. 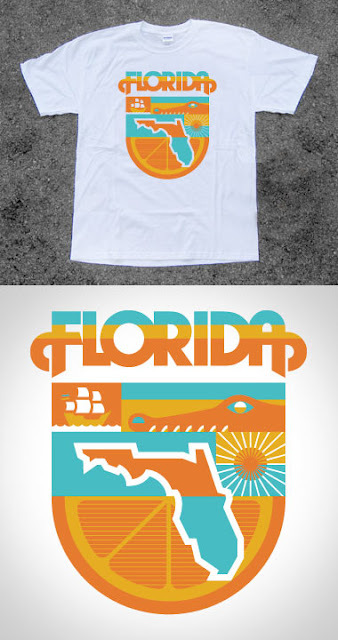 Draplin Design Co. "DDC-050 Florida Torso Cover"
A bright design to welcome the warm weather, from the big man responsible for one of my all time favorite logos. 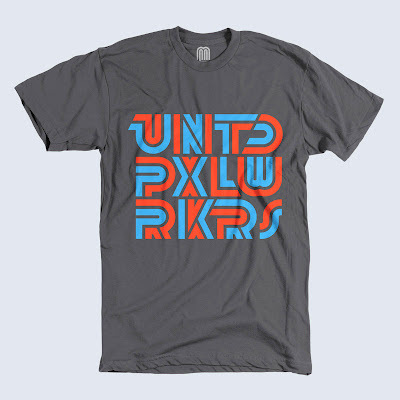 Draplin Design Co. has an extensive merch section for a design firm. If you’ve got 3 minutes to spare, check out Aaron Draplin getting fired up about the current state of graphic design. I don’t know why I passed up the chance to see him speak in Philadelphia this past September, I sure hope he comes back around someday.